Best Wishes for the New Year! Here in west Michigan we finally have a little bit of snow. That makes playing outside feel like winter fun. This month I'm offering a new product - a puzzle book - for sale, and am continuing to give programs about the North Country Trail. Use the links at the bottom to see a schedule of future programs and book signings, or to order North Country Cache, or other products. 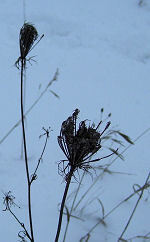 The background "quilt" is made from designs generated from WINTER WEEDS, picture 5. Click here to add your email to the newsletter notification list (a popup window) Your email will not be used for any other purpose. "Frankly, even though I loved my college Botany class, I had completely forgotten the Myxomycophytes. We had encountered Scrambled-Egg Slime (you can probably guess what that looks like) on earlier hikes. But I'll never forget about slime molds again. A patch of slime mold that was moving! "Ahead of us on the trail a patch of black mud, two by five feet, is shimmering wetly in the afternoon light. In fact, it appears to be moving, but that must be impossible. We move closer and "welcome to Eerie," Wisconsin, it IS moving, waving tiny stubby arms. "You can be sure that as soon as I returned home I began trying to find out what that patch of mud might have been! It was surely a slime mold, but even that information is only moderately informative. 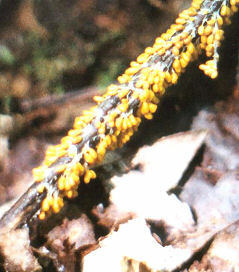 Slime molds seem to be sometimes plants, but sometimes animals. Even the experts can not agree where to place them. "They have a three-phase lifestyle: the resting spore, the sexual stage, and the truly astonishing plasmodium. The resting spores are most like fungi when they grow small stalks or threads, containing spores which are dispersed by the wind. 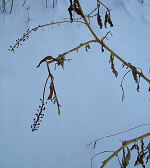 These stalks, threads and spores may have distinctive shapes or colors and are the visible forms we usually see. When the spores germinate they give birth to naked gametes. You may think that you too were once a cute little naked gamete, er... gamin, and yup, these babies grow up and mate with a buddy. But the similarity ends there. "As soon as the gametes pick a partner the two fuse to become a zygote. As the zygotes grow they lose their cell walls and become a mass of protoplasm (think- the inside of an amoeba with no definitive outer edge) with many nuclei. 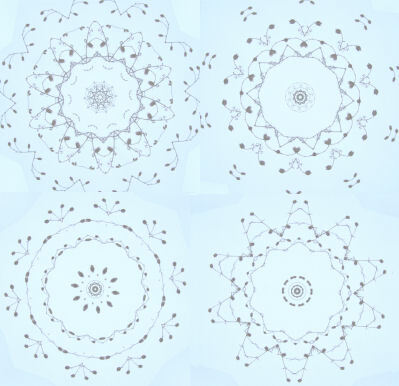 Somehow this mass of fluid arranges itself into a fan-shaped network with vein-like branches. This plasmodium flows over surfaces surrounding and digesting bits of organic matter. Waste products are simply left behind as the plasmodium flows on. 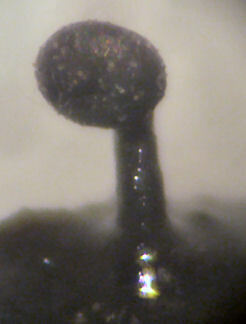 At some critical nutrition and size the organism again begins to produce spores. Our waving fingers may have been the spore stalks beginning to grow. "How bizarre and rich is the world! God once reminded Job of His vast and varied creation, and Job replied to the Lord, 'I spoke of things I did not understand, things too wonderful for me to know!'" So now, I'm trying to grow my own slime molds in petri dishes. I was going to tell you that so far I only have slimy bark chips, but I just went to check them again. 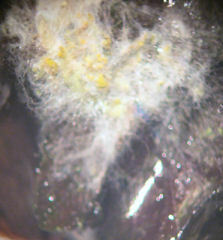 After one day I have this growth on apple bark, which appears to be a mix of a white filamentous slime and a yellow sac-like something, unless that is the plasmodium and the beginnings of sporangia. And after 20 days, on the black cherry bark I found one, count it!, sporangium. 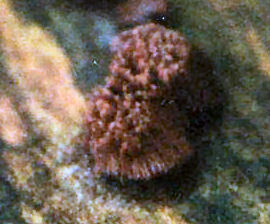 That's the fruiting body. I have no clue what kinds of slime these are, but they are interesting. I may not be able to identify them yet, but that doesn't stop me from being curious! excerpt from North Country Cache, chapter 33, "A Nice Walk in the Woods"
Maggie is my dog; at any rate, she lives with me. Suzanne, a ten-year-old who now lives in Oregon, firmly believes that Maggie is hers. Maggie began her life as we know it at a shelter, one of a litter of very sick little baby dogs. Suzanne's mother thought it would be fun to have a puppy and a toddler at the same time. The toddler was unflappable and the puppy was listless. Many days and many dollars later it appeared that the red, wiggly four-legged baby with the golden eyes would survive a serious case of double pneumonia. Many months and many more months later it also appeared that we would all survive the toddler with the mind of her own. Actually, she has become a poised young lady who plays the violin and loves to read. Oh, sorry, this is supposed to be about a dog. So the idea of a puppy and the toddler together quickly lost its appeal and Maggie moved in with the grandparents, Suzanne's, that is. But they both had full-time jobs, and Maggie was spending 20 of 24 hours each day in a cage. Twice daily walks around the block were woefully inadequate for a now-healthy teen-aged pooch. They begged me to take Maggie home. But I wasn't sure she was the dog for me. She had bad hips; "No putting a pack on this dog," Doctor Jim admonished me. She needed Dramamine to ride in a car for longer than ten minutes. But finally it was my house, or back to the pound for Maggie. Of course she came with me. Although she is dog enough to love day hikes and snuffling through the underbrush, she's not really interested in becoming a backpacking hound. I took her on a weekend jaunt (she outgrew the worst of the motion sickness), carrying all her gear for her. She whined, and wanted under her blanket in the warmest spot by the fire. She nervously whimpered at ordinary night noises, and wrestled me for first rights to the sleeping bag. At home she won't even venture off the porch in the rain. After organized coaxing and training she has learned to cautiously enjoy chasing waves at the beach. So Maggie's attitude toward serious outdoor adventures has made it easy to follow Dr. Jim's instructions. Now, her doctor, er... vet, says she should lose ten pounds. Maybe your vet, er... doctor says the same thing to you. Being a dog of very little fur, she's always tended to be cold. She insists on sleeping under the covers of the bed. But recently she's developed a new fetish. Our house has an annoying, but apparently harmless, infestation of tiny black flies. They don't bite, but they do like to hover around one's eyelashes and ears. Maggie has both, especially the ears. She has taken to snapping at the flies, pretty much constantly, whether they are evident or not. 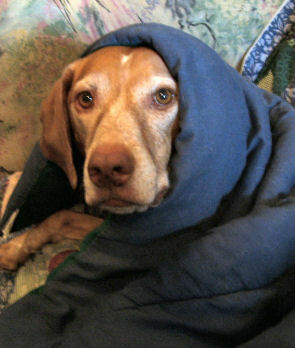 So now, to escape the flies, she worms her way under a blanket on the couch, where the flies can not molest. But someone just called her name... perhaps for a short walk through the nearby woods with scrunchy leaves to overturn, an old rabbit trail to sniff out, and a full supper dish awaiting at the return. And that's why Maggie wears a babushka. Grand Rapids, Michigan is working hard to become a center for health care and health education in the state. "Healthcare Hill," northeast of downtown, proposes to bring in 500 medical students and create over 3000 research and healthcare jobs. This means lots of new buildings. For once, some of the planning includes designs that promote healthful living, such as walking. 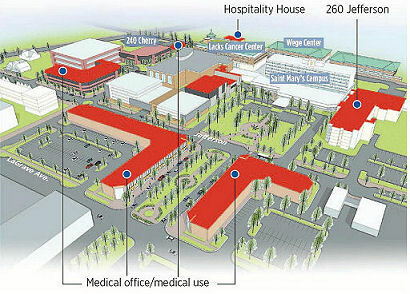 St. Mary's downtown healthcare campus will be expanded to 26 acres. The mixed-use plan calls for medical offices, retail and residential condominiums, with a pedestrian friendly urban design. More about Grand Rapids health industry growth, Grand Rapids Press story, Jan. 5, 2007. Changelings: Change one word to another one letter at a time, but each word in between must also be a word. For example, you can change FLAME to BLAZE in only 2 steps: FLAME, BLAME, BLAZE. Try your hand at these: SHOE to BOOT (4 steps), CAVE to HILL (5 steps), TOAD to FROG (10 steps). 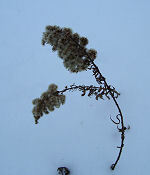 Most people view winter weeds as a garden menace to rout. 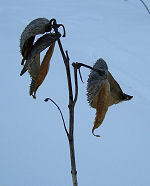 Others enjoy the forms and design. 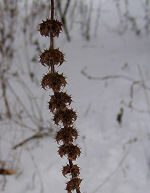 Match the pictures of these common "winter weeds" (dried seed heads of summer plants) with their names.